A small satin-like fruit streaked with purple stripes and varying in colour from golden-yellow to apricot. 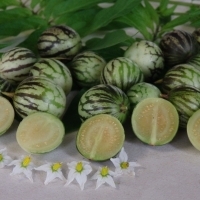 The pale yellowish-green flesh has a juicy melon-like texture. It is a delicious subtle flavoured fruit similar to a honeydew or rockmelon. Closely related to the tomato this shrub grows in a sprawling habit and makes an excellent ground cover plant. It tends to fruit better when grown over a trellis. The foliage is susceptible to damage by light to moderate frosts, however will quickly recover with warmer weather. Fruits are round berries, to 2cm in size, which ripen to yellow or pale green, with dark-colored longitudinal stripes. 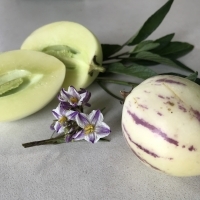 The flavor and texture, while similar to the pepino, tends to be tangier and more juicy. Performs best in a warm, relatively frost-free climates.